So far the weather this Summer has been a bit, let's say, unpredictable. We've been going back and forth for the last two months with weather that hasn't made its mind up giving us hot and humid days verses muggy, humid and rainy days. Fun right?! NOT! On the occasion day where we do actually get some nice weather without the rain, no matter how humid it is, I'm always up for laying out in the sun. It feels nice and refreshing on my skin and being outdoors just makes me happy. What makes me even more happy is when I got two new products from Hawaiian Tropic sent to me to try out. I absolutely love their brand. 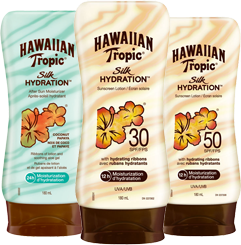 I received both the Hawaiian Tropic Silk Hydration Sunscreen Lotion SPF 30 along with Hawaiian Tropic Silk Hydration After Sun Lotion. Both products have been used and are absolutely loved. A few weeks ago when we had some nice warm weather, the family and I went swimming at a family BBQ. I made sure to put on the SPF 30 before I left home and brought it with me just in case. For my kids I use Banana Boat, but for myself, I have to say Hawaiian Tropic is one of my favorites. Let me just say that this sunscreen smells absolutely refreshing and delicious making me want to be sipping on a Pina Colada while I was out in the sun. Not only that, but I love that it lasts up to 12 hours and that it's light and non greasy. I can't stand a sunscreen lotion that makes me look and feel all oily in the sun. That's one of the worst feelings ever, for me anyways. And when you're done in the sun, time to apply that Silk Hydration After Sun Moisturizer. Not only will this keep your skin moist and hydrated for 24 hours, but it also smells delicious and refreshing too. I swear I'd love to actually be in Hawaii while wearing both the sunscreen lotion and the moisturizing lotion, but since I'm not my backyard with a nice Summer drink and laying out in the sun (whenever it comes out again) will do. The moisturizer also is infused with mango and shea butter, so your skin will feel nice and smooth along with being hydrated. I've also used this when stepping out of the shower, it works great. It keeps my skin hydrated and once I put it on, I don't have to keep reapplying it. Disclosure: All opinions are my own. I received the above mentioned products and a $50 visa gift card at no cost for the purpose of this review. No other compensation was received. It's that time again, time for our lovely readers to have a chance at sampling both the Silk Hydration Sunscreen Lotion along with the Silk Hydration After Sun Moisturizer. What we need is 25 of our Canadian readers to try out both products and then let us know your thoughts on how you liked it or didn't like it. Once you send us your review you'll be entered to win a $50 Visa Gift Card! That simple, free products in exchange for a review and you may be one of the readers to win $50! How can you get in on this opportunity?! Simple, leave a comment letting us know what your plans our for the Summer. Once you do that click HERE to fill out your information and that's it! UPDATE: Thank you all who left a comment and filled out the form. The sample opportunity is now closed!